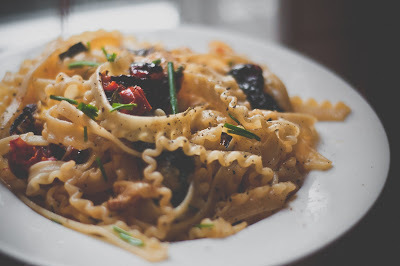 I always have pasta in my cupboard and I've recently discovered tripoline pasta which is quite a thick ribbon pasta with lovely frills down one side, it reminds me of really pretty underwear. You can buy it in Tesco for about £1.19 for 500g and it's currently my new favourite pasta shape (everyone has one of those right?). What I love about this is you just bung all the veg in the oven then stir it into your pasta, it works with pretty much everything so just add/leave out anything you fancy and in just 25 minutes you have an ace dinner bursting with big flavours. Preheat the even to 200 degrees/ gas mark 6. Put all your chorizo, veg, olives, garlic, chilli and herbs in a tray and drizzle with a little bit of olive oil. Roast for about 25 minutes or until all the veg is soft and starting to brown. Cook your pasta then drain and add your roasted meat and veg. Stir well, season and serve topped with your chives. Stop losing your keys, fool!